I found the crumpled note at the bottom of a bulging plastic bag perforated by Mom’s metal knitting needles. It was written in pencil, faintly legible, and blemished with Maxwell House stains. I recognized her handwriting instantly. She had scribbled on the ripped remains of a legal-size white envelope. Thrifty to the core, a proud child of the Depression, Mom rarely gave me a birthday or Christmas present wrapped in anything other than recycled gift paper. She used envelopes for grocery lists, quick messages to her four kids (“At the A&P, back by 5”), and, apparently, knitting patterns. The writing continued: “10 rows black. W.B. Orange. K 5 rows blue . . . Purl back for 10+ rows.” Was she knitting socks? Slippers? The directions made no sense. And I couldn’t get them to work. 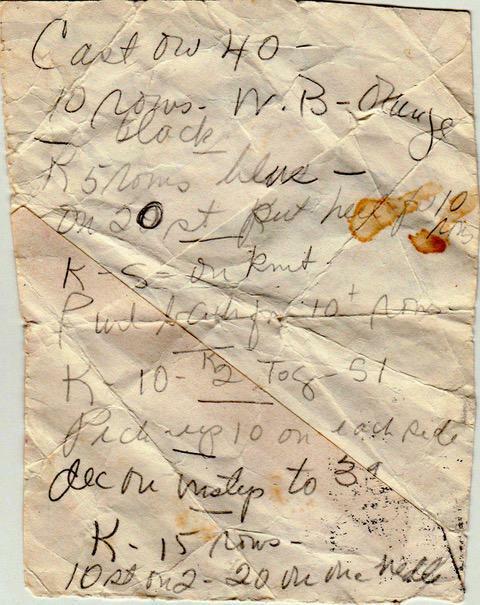 The writer’s mom left behind a crinkled note (above) with mysterious knitting instructions. My mother knitted until the week before she died on a Sunday morning in February, 22 years ago. Throughout her eight decades, she tapped her abundant innate talents to make macrame plant hangers, hand-turned pottery bowls, and Singer-sewn kitchen curtains. She was a teacher, a traveler, an experimental cook. After she retired from teaching 10th-grade social studies, she spent mornings sitting at the kitchen table, pecking away on her Royal typewriter, writing fiction and family memoirs. But knitting was her passion. When I was 8, I spent 10 days in the now-closed French Hospital in New York City, recovering from an unscheduled appendectomy. I often woke up at night and saw Mom in a rocking chair near my bed, knitting and bathed in amber light. She shrouded the floor lamp with a towel, giving her just enough light to see the stitches but leaving the room dark enough so that I could sleep. For many years, Mom knit conventional and classic wool wear for her family. I treasured the ecru Irish fisherman’s sweater she made for my daughter, Alex, when she was 2. Even today, my son, Chris, proudly wears his extra-long black stocking hat on ski weekends in Vermont. 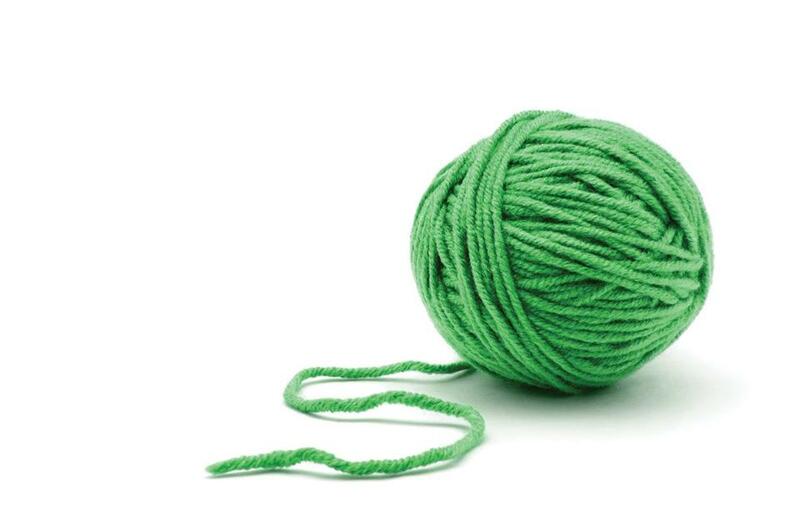 As she aged, however, a psychedelic sensibility kicked in that dominated her choice of yarn colors. Overnight, navy blue and hunter green creations inspired by Martha Stewart gave way to vivid orange, livid purple, loud pink, even screaming aqua. (We wondered if she’d been locked overnight in a Peter Max exhibit.) The grandkids called these concoctions “MomMom-isms.” They went immediately into the costume box. The absolute worst is a sleeveless hip-length tunic she patiently knitted on humongous size 15 needles, in vertical stripes of neon green and chrome yellow. My sister and I found the finished garment in her project basket several days after she died. “Must have been for you,” I told Robin. “No way — she loved you more,” she said with a wink. Neither of us wants the atrocity, but neither of us can throw it away or donate it to Goodwill. It’s earned sacrosanct status because we know it was one of Mom’s last projects. So Robin and I have had fun with it, foxily passing the sweater back and forth for years. I’ll wrap it in parchment paper and stick it deep in her freezer. Two months later I discover it hanging in my guest room closet, lurking behind a white Turkish robe. It then goes back to her as a birthday gift from one of her friends whom I enlist as a coconspirator. We just can’t part with the ugly sweater. Nor can I part with Mom’s mysterious note, written probably four decades ago on this crinkled piece of paper, a puzzle of knitting hieroglyphics. It’s her way, I believe, of telling me to keep knitting. And despite 75-year-old fingers bent and swollen with arthritis, I do. Freelance journalist Valerie Marier lives and knits in Kennebunk Beach, Maine. Send comments to connections@globe.com. Follow us on Twitter @BostonGlobeMag.